The CoffeeShop Blog: CoffeeShop "Beach Dreams Rosy Sky" Photoshop/PSE Action! CoffeeShop "Beach Dreams Rosy Sky" Photoshop/PSE Action! 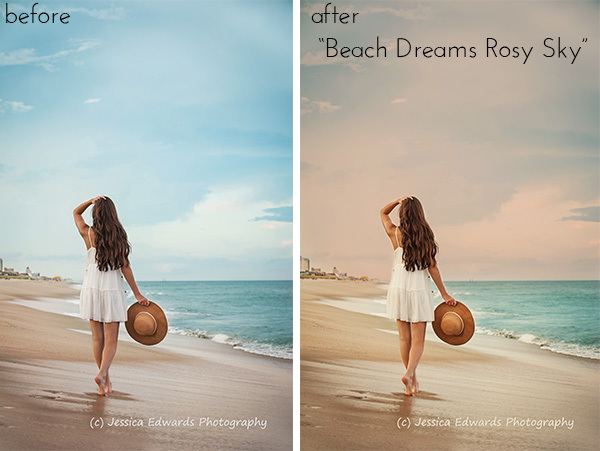 Today I have a brand new action called "Beach Dreams Rosy Sky". 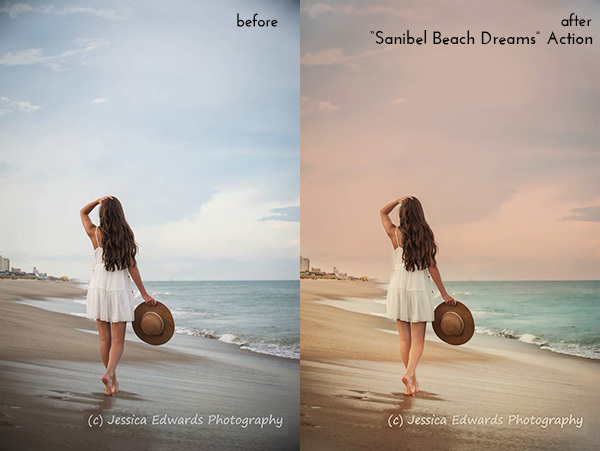 This action lets you paint on a gorgeous rosy-ivory tint to the sky and beach of any beach image, including portraits. If you want to see the "Action UnWrapped" Tutorial where I walk you through the entire edit without an action, you can visit this page. 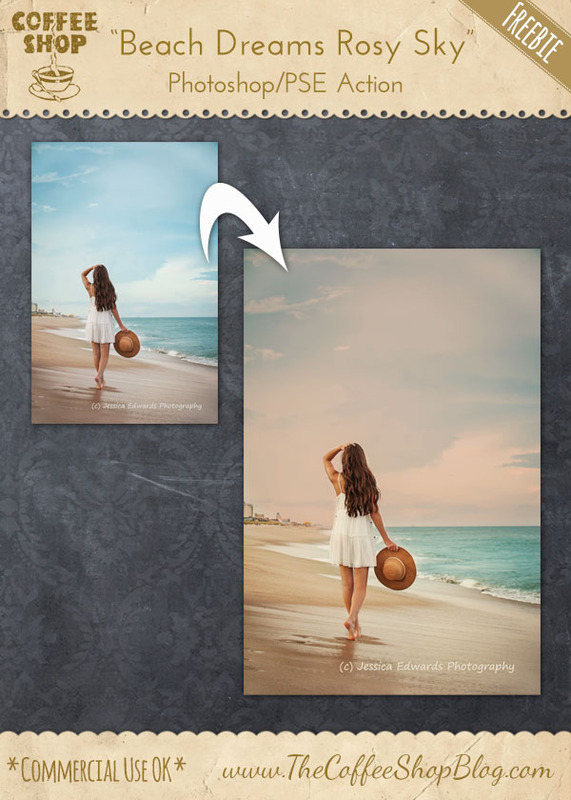 I like to run the "Beach Dreams Water & Sky" action on my beach portraits first before running this action. This is the edit I will walk you through today below using the action. The gorgeous original image is by Jessica Edwards Photography. 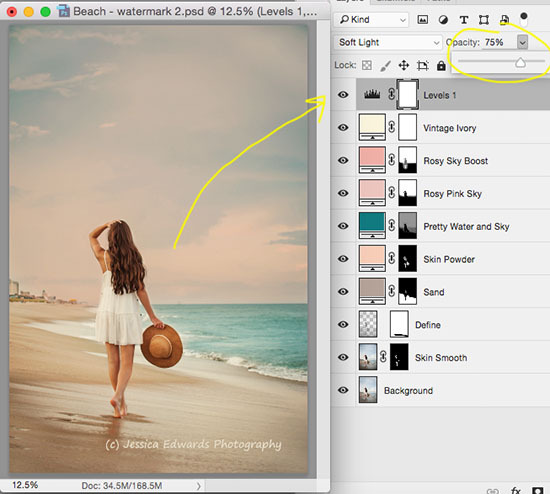 You will have to paint on layer masks to use this action, so if you are new to them please go read this tutorial. 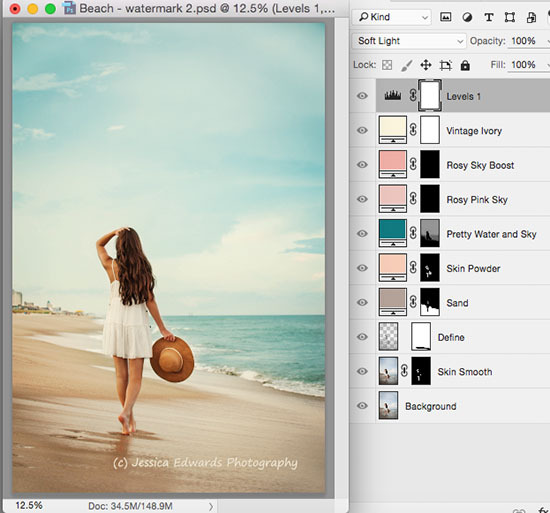 If you want to grab the full "Sanibel Beach Dreams" Photoshop/PSE action that is an all-in-one beach edit (retouching, blue sky and beach, gorgeous sand, rosy-ivory vintage effect), it is now a part of my CoffeeShop Action Download pack. Purchasing my convenient download packs support this site and keep everything here free! And to thank you for your support there are several actions included as a special gift that are not found for free here on my blog (Sanibel Beach Dreams, Magic Retouching Make-Up Kit, and the Watermarking Kit). Plus you can request free updates up to two years after purchase (and I update them weekly!). I first ran "Beach Dreams Water & Sky" on this image. 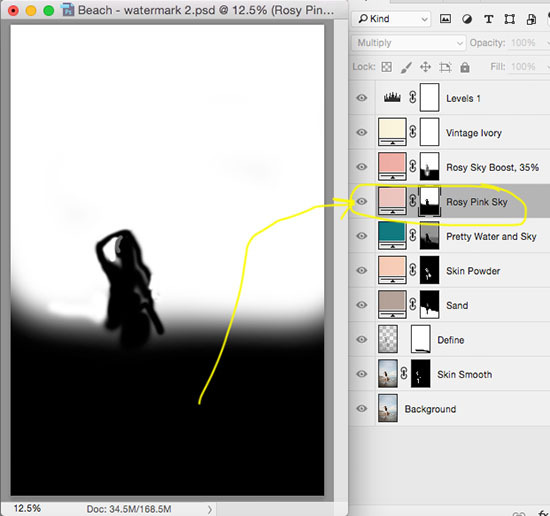 Then I clicked on the top layer to select it (in this case Pretty Water and Sky) and then ran "Beach Dreams Rosy Sky". There won't be much of a change before you paint on the layer masks to add the rosy-tint. I used a white soft brush on the "Rosy Pink Sky" layer to add that layer to the sky. I used a soft white brush to add "Rosy Sky Boost" to the sky and her legs. Then I used a gray brush to add the effect to her entire body. 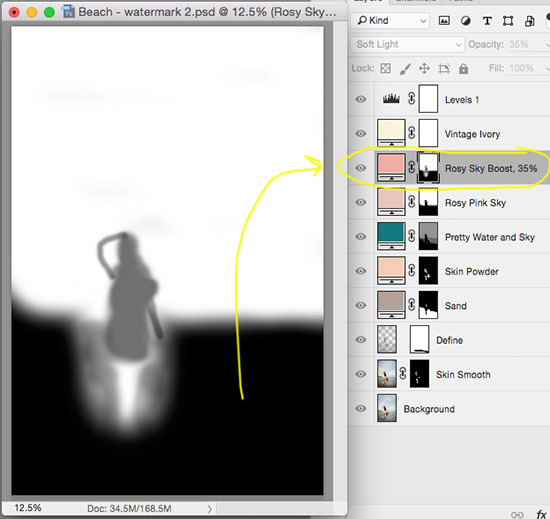 I also reduced the opacity of that layer to 35%. I left "Vintage Ivory" as-is, but reduced the Brighten layer on top to 75%. I love the gorgeous colors in the final edit! I would love to see your own edits using the action over on my Facebook page. Download the CoffeeShop "Beach Dreams Rosy Sky" Photoshop/PSE Action. You can also download it here. Thanks for another great action and tutorial Rita. I look forward to practicing when I get some free time. Thanks Lisa! I hope you enjoy using them!!! You are so welcome Annie! Just go to the order page where you will find my email and send me a note and I will get back with you!! !